Glenavon will continue their defence of the Irish Cup with a semi-final meeting against Coleraine at the Ballymena Showgrounds on 1 April. 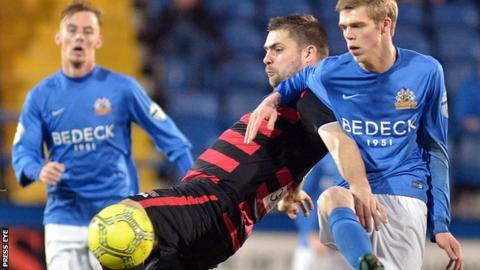 The Lurgan Blues thumped Portadown 5-0 in Saturday's quarter-finals while the Bannsiders beat Ballymena 4-0. Linfield will take on Dungannon Swifts in the other semi-final with Mourneview Park hosting the game. A 2-0 win at Crusaders sent the Blues through while Dungannon overcame Warrenpoint 2-1 after extra-time.